Amid the ageless beauty of the Peak District, Buxton is the highest market town in England, at 300 metres above sea level. Travellers came to Buxton to drink its spring water for hundreds of years before the 5th Duke of Devonshire, William Cavendish set out bold plans for a spa resort in the 18th century. He commissioned Buxton Crescent, a dignified terrace of townhouses, and the Devonshire Dome, still the largest free-standing dome in the UK. You won’t be able to take your eyes off the romantic hillscapes dwarfing Buxton, and you can strike out from the centre of town on foot to scale these peaks, crossing moorland and ancient woodland on the way. 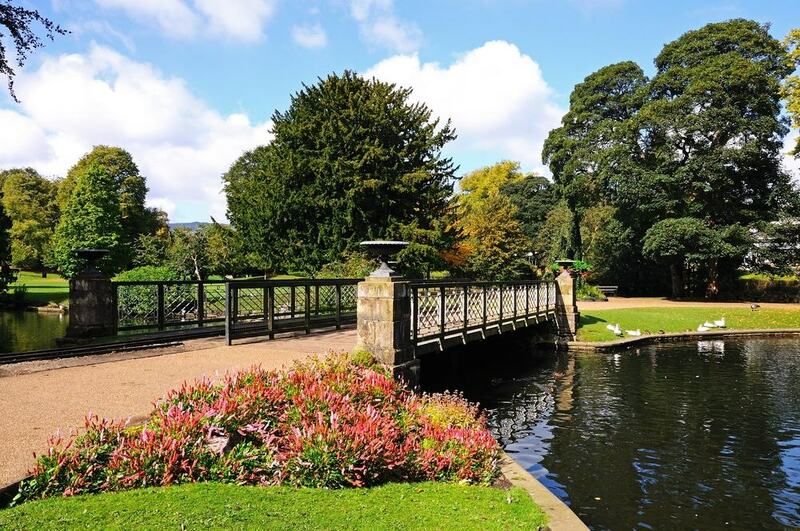 The pride of Buxton is a graceful 10-hectare park opened on the Wye in 1871 and designed by the prolific Edward Milner. The park’s ornamental lakes, flowerbeds, mature trees, meandering paths and wrought iron bandstand are suffused with Victorian splendour. Children can take a trip on the miniature train and clamber through the play areas, while grownups can appreciate the metal and glass Octagonal Hall (1875) and Frank Matcham’s regal Opera House. Pavilion Gardens is a yearly Green Flag winner (the gold standard for parks in the UK), and boasts a coffee bar and arts and crafts gallery, which we’ll talk about in more detail below. Take a peek at the calendar before coming to Buxton as your trip may coincide with one of the arts and crafts, jewellery and antiques fairs staged in Pavilion Gardens in summer. 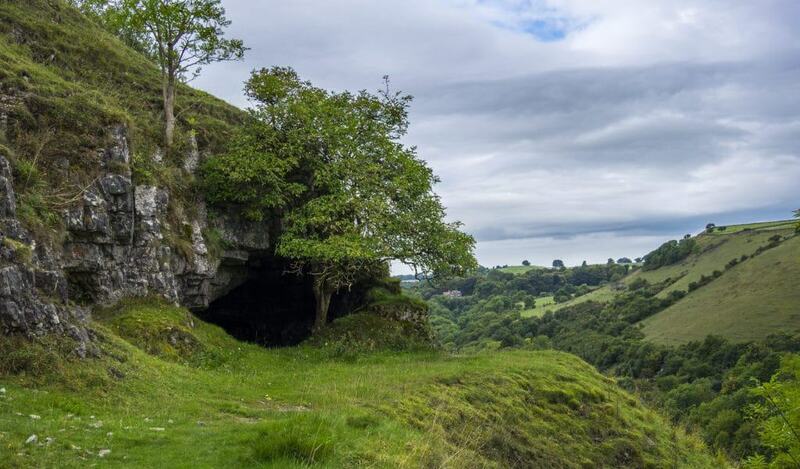 This limestone cave within walking distance of the centre of Buxton is two million years old, and was inhabited by people in the Bronze Age and Roman Period. The cave has been on the tourist map for nearly 350 years, and before that is believed to have been visited by Mary Queen of Scots. Led by an expert guide you’ll trail through 300 metres of chambers, admiring weird concretions like the Mary Queen of Scots Pillar and the Poached Egg Stalagmites, which have yolk-like pigment on their tips. 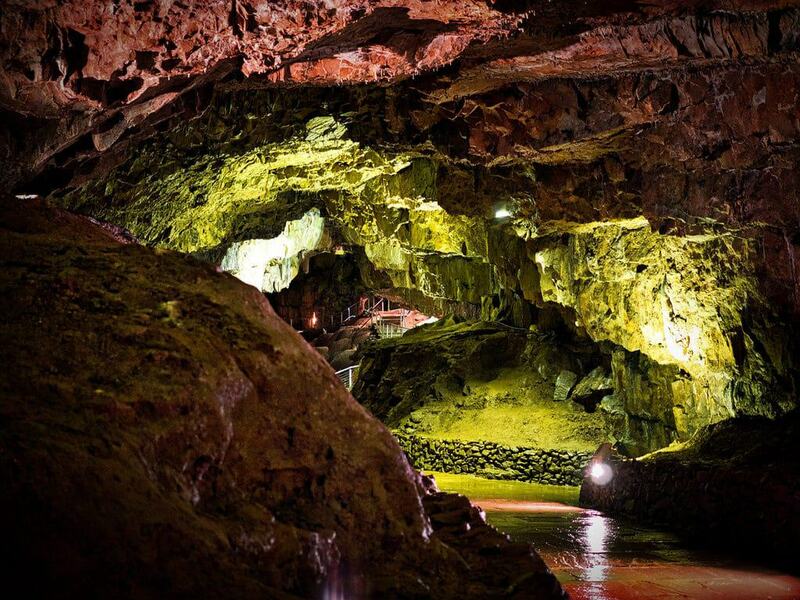 The cave is open year round and sits within Buxton Country Park where you can explore woodland trails and scale the 437-metre Grin Low hill. In the old Peak Hydrophathic Hotel (1880) the Buxton Museum and Gallery has exhibitions for archaeology, history and geology, all sourced in the town and the Peak District. The Wonders of the Peak exhibition presents a timeline from the Big Bang to the Victorian period. You’ll learn how the range was formed and inspect fossils of Pliocene mammals that once prowled the Peak District, like scimitar-toothed cats and cave lions. The Boyd Dawkins Study recreates the workplace of the eminent archaeologist and geologist Sir William Boyd Dawkins who uncovered many of the fossils on show in the museum and whose archives and library were donated to the town after his death. The art department has a variety of paintings, prints and watercolours by the likes of Marc Chagall, Frank Brangwyn and Edgar Chahine. The Cavendish family, responsible for Buxton’s emergence as a spa resort, have their seat at this spellbinding stately home, 15 miles east in Bakewell. 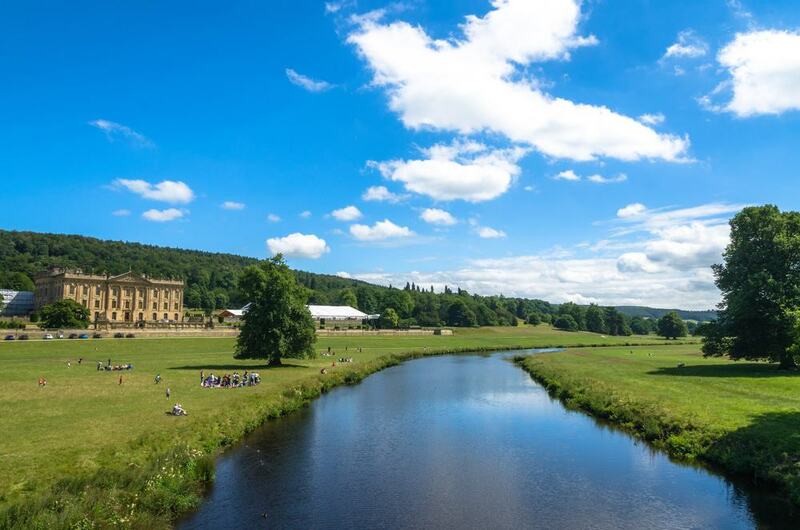 Chatsworth House is a drive that you have to make, not least because the road weaves through the hills, woods and moorland of the National Park. On arrival you’ll be caught in the spell of one of the UK’s most lavish properties, endowed with art by Rembrandt, Veronese and Joshua Reynolds, as well as Roman and Ancient Egyptian Sculpture. The house had two big building phases, in the 17th and 19th century, and invites you to explore more than 30 rooms, like the glorious Painted Hall, State Rooms, Sketch Galleries (with drawings by Old Masters) and the Sculpture Gallery. The 105-acre garden represents 500 years of horticultural knowhow, and has retained many centuries-old features like the Cascade, 1st Duke’s Greenhouse and the cascade. 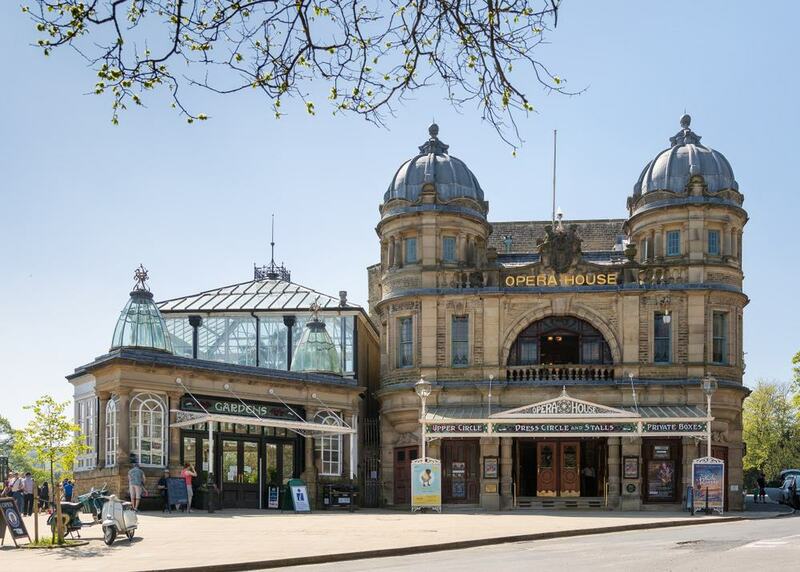 Frank Matcham, the UK’s foremost theatre architect at the turn of the 20th century, designed Buxton’s 902-seat Opera House, which opened at Pavilion Gardens in 1903. After 25 years hosting touring opera and theatre companies, the Opera House functioned as a cinema before being restored and reopened as a live performance venue in the 1970s. It’s a marvellous building, both inside and out , with a pair of Neo-Baroque domes on the facade, and cherubim, gold leaf, exuberant plasterwork and frescoes adorning the auditorium. The Opera House has a programme of opera, classical music, choral performances, comedians, movie screenings and touring tribute acts, also organising shows and recitals at the Pavilion Arts Centre and other venues around the town. 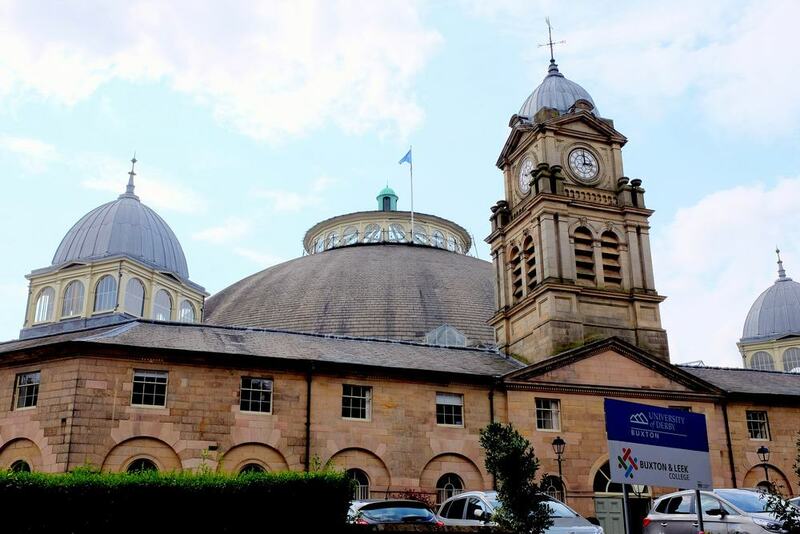 Part of William Cavendish’s ambitious plans for Buxton, the Devonshire Dome has the largest unsupported dome in the UK. It was built in the 1780s on an octagonal base, and was intended to house horses and servants for the guests of the Buxton Crescent, another of Cavendish’s imposing projects. The Devonshire Dome was restored in the early-2000s and belongs to the University of Derby’s Devonshire Campus. Visitors are welcome to go in to marvel at the dome, which at 44.2 metres outstrips both the Pantheon and St Paul’s Cathedral. Inside there’s a commercial spa, a cafe and restaurant, while the dome is a magnificent space for fairs and functions all year round. To the northwest of Buxton, the Goyt Valley is a tract of breathtaking countryside at the source of the River Goyt. 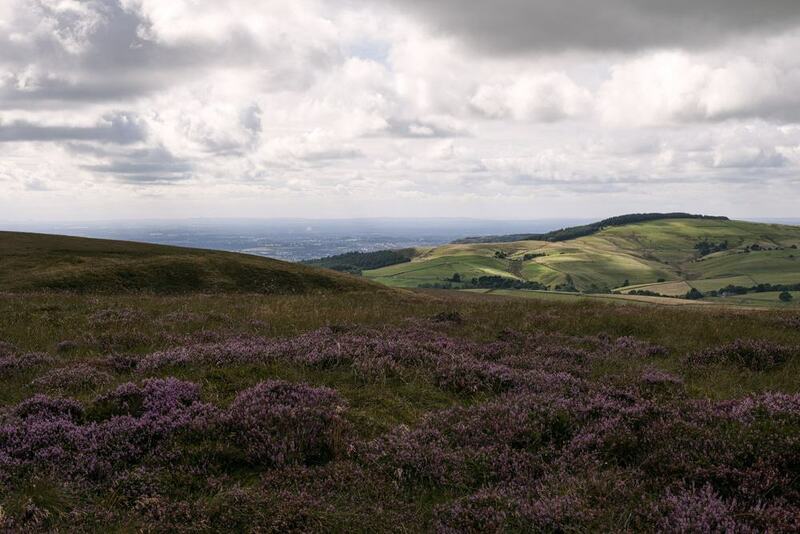 There’s a mixture of forest, moorland and farmland, threaded with walking paths and bridleways. Parcels of the valley can be gentle, while others are a tougher proposition, with soaring slopes and high gorges. 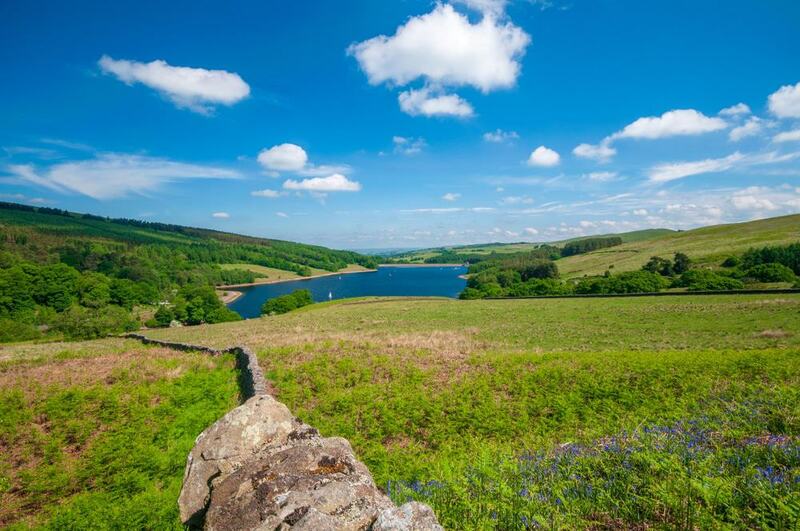 The valley has two large reservoirs, Fernilee (1937) and Errwood (1968), and you can hike around their wooded perimeters for an easy walk or take on the slopes that plunge to the water. There are 18 signposted walks in the valley, with something different to see on each one, from a packhorse bridge to the ruins of Errwood Hall and traces of the abandoned Cromford and High Peak Railway. You could follow up a visit to Poole’s Cavern with a walk through the woods and past cow herds up to this Victorian folly 440 metres above sea level. Solomon’s Temple was unveiled in 1896, replacing a tower from earlier that century. That structure had been built by one Solomon Mycock, owner of the Cheshire Cheese Hotel, which is where the name comes from. The location is significant because of the presence of a Bronze Age barrow (burial mound). 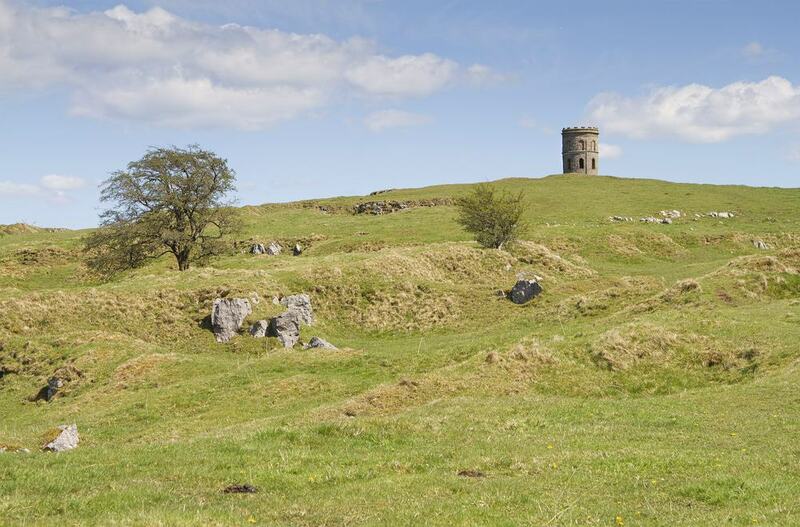 The temple is a calf-shredding climb from the cavern, but is mandatory for the exhilarating views over Buxton and the Peak District atop its spiral staircase. Taking inspiration from the Royal Crescent in Bath, the distinguished Buxton Crescent followed just over a decade later in 1789. 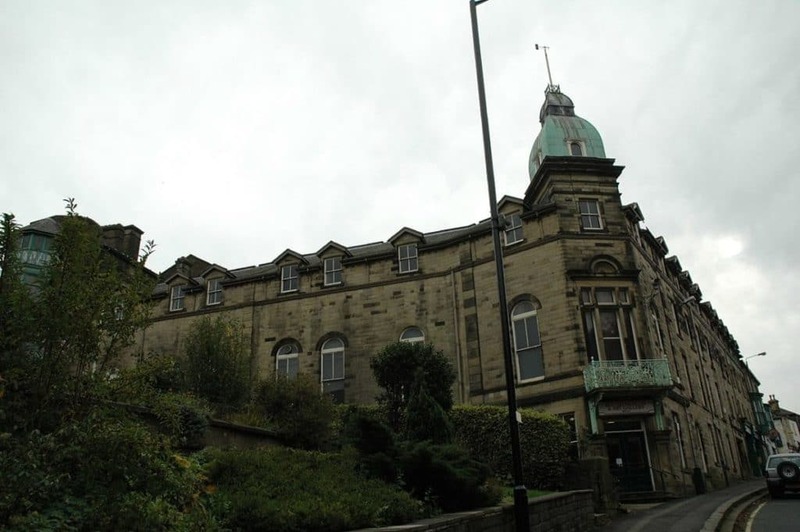 The development was commissioned by William Cavendish as part of a project to transform Buxton into a fashionable Georgian spa town. This arc-shaped terrace of townhouses footed by an arcade also had a hotel and lavish assembly room. The development faces the foot of the Slopes to the southeast, where you’ll find St Ann’s Well, which we’ll talk about underneath. 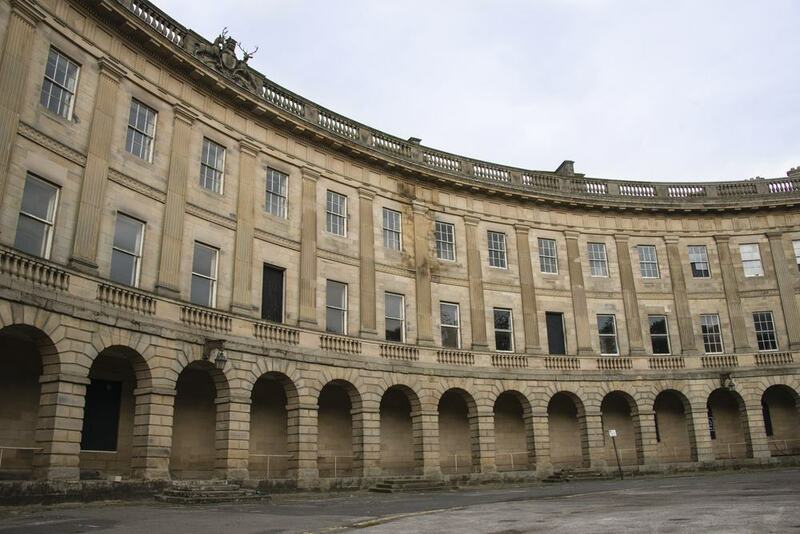 Also opposite is the Pump Room, which, like the Crescent is owned by Buxton Council. When we wrote this post in 2018, both buildings are undergoing long-term renovations, due to finish in 2019, by which time the Crescent will reopen as a single hotel. Being in Buxton you may want to get out and see as much of the Peak District as possible. For another excursion Axe Edge Moor is at the boundaries of Derbyshire, Staffordshire and Cheshire. The three counties meet at the Three Shires Head on the River Dane, where you’ll find a packhorse bridge from the 18th century. If you can stand the brisk water, there are natural pools to swim in here. Axe Edge Moor begins a mile or two southwest of Buxton and rises to more than 550 metres. Try to come on a clear day, as the vistas from the high trails over the moor are phenomenal. There’s no more fitting place to take a rest than England’s second-highest pub, the Cat and Fiddle Inn. 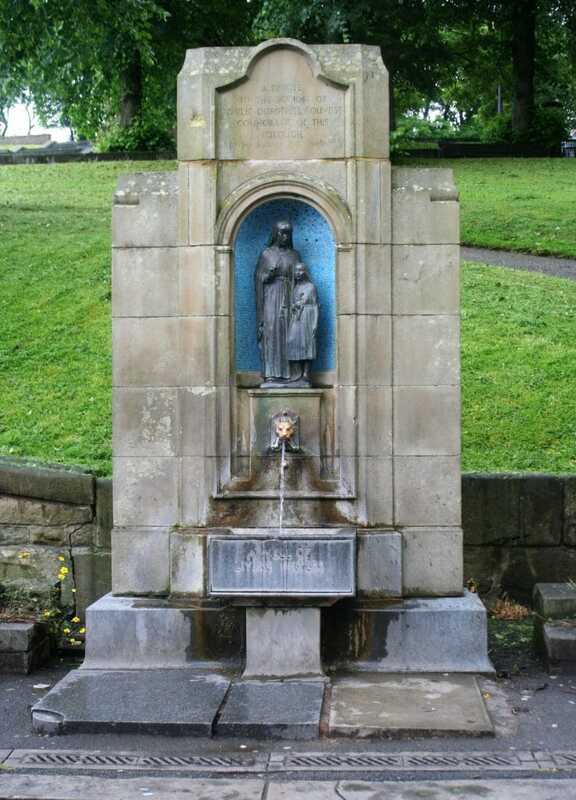 Right across the road from the Crescent, at Ann’s Well is where you can sample Buxton’s famed mineral water – just remember to bring a bottle. The water comes out at 28°C, so just above room temperature and unlike many natural springs has a smooth taste with a little aeration. Percolating from a mile below ground, the spring also picks up some harmless radiation. There has been a shrine to St Anne here since the Middle Ages. For a time this was housed in a chapel, which was closed down during the reign of Henry VIII. Mary Queen of Scots is known to have taken the waters when she was a prisoner at Chatsworth House in the 16th century. While idling in the Pavilion Gardens you could call in at this gallery in the main building next to the tourist information desk. 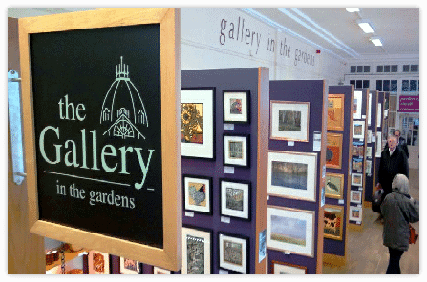 The Gallery in the Gardens is a platform for painting and arts and crafts by more than 40 local artists and craftspeople. Their works are for sale and include textiles, ceramics, paintings, calligraphy, embroidery, glass, linocuts, etchings, woodcarvings and prints. Whenever you come, one of the artists represented at the gallery will be in attendance, and will be happy to explain their creative process. An active day out for grownups and kids aged 10 and up, Go Ape Buxton is a high ropes course in dense forest in Buxton Country Park. 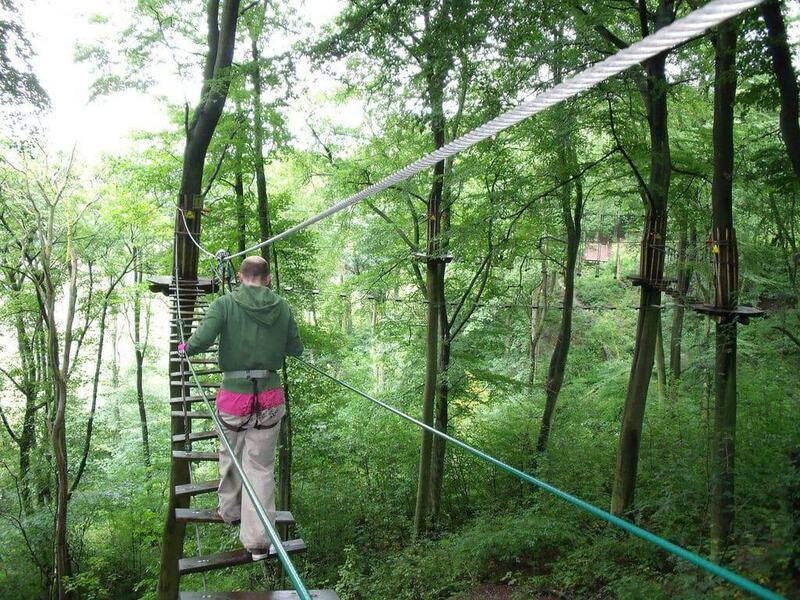 Being in the Peak District, Go Ape Buxton is at more than 360 metres above sea level and the full 733 metres of zip-lines, Tarzan swings and wobbly bridges will take up to three hours to complete. The highest platform here is over 11 metres above the forest floor and the longest crossing between tree platforms is 19 metres, so try not to look down! As with all high ropes courses, it’s a good idea to bring a pair of climbing gloves with you. 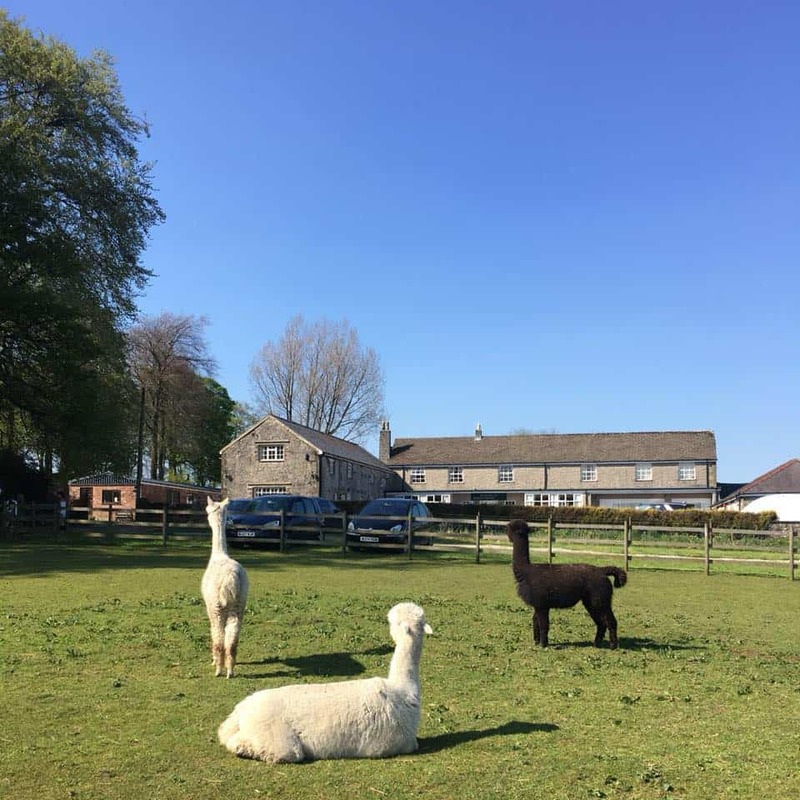 In bucolic Peak District countryside on the southeast edge of town, Archie’s Farm is a rural attraction where kids can pet and interact with all sorts of friendly domestic animals. The farm is open during school holidays, and has goats, alpacas, donkeys, tortoises, ducks, chickens, pigs, sheep, rabbits and guinea pigs. The farm has a schedule of feedings for its pigs, alpacas and goats, when children can pick up facts about the animals, while twice a day they’ll be able to handle guinea pigs. The farm offers sand diggers and space hoppers for little ones to play with, and has a grassy picnic area. Back into the Peak District National Park, Millers Dale is a scenic valley on the River Wye. The valley is traversed by two railway viaducts, one from 1866 and another, parallel, that was erected in 1905. These were on the Manchester, Buxton, Matlock and Midland Junction Railway, which was closed in 1968. You can cross one of these imposing old structures on the 8.5-mile Monsal Trail, which follows a section of the former line, past former stations and through six tunnels. Millers Dale is also noted for its geology, and the disused Station Quarry the strata have been exposed to show layers of limestone between a band of shale, while there’s also evidence of ancient lava flows nearby.